Why bevel a drawer bottom? No one sees it, right? Maybe not, but if they do, it can be an impressive discovery. Beveled drawer bottoms that are fitted into grooves are found in some antique furniture, but I have also seen flat and beveled boards that were nailed or pegged to the bottom edges of the drawer sides. I can think of 4 possible reasons why woodworkers might have beveled their drawer bottoms, but if you know for sure, please feel free to comment. 1. Feel substantial. Rap on a thin drawer bottom and it sounds hollow, and may even rattle if it's fitted into grooves, but a beveled one feels and sounds solid. 2. Add an elegant and finished look. 3. Take less time to make than it would if you had to reduce the thickness of the board along its entire width with a handplane. 4. May have been a signature design element for some cabinetmakers. Moreover, they are simple to make. Begin by laying out pencil lines on the face of the board that indicate where the bevel will terminate (I use a combination square). If you use a marking gauge on the face, you'll create scratches, and pencil lines are more easily planed away. Use a marking gauge along the edges to mark the final thickness, which is determined by the width of the groove into which it must fit. 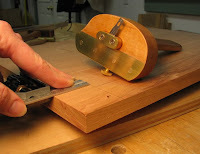 I always start with the long grain and plane away the area between the pencil and marking gauge lines . If you start with the cross grain, it's possible to create tearout on the long grain edge that can't easily be repaired. I use two planes for this task. One has a more open throat and can take a bigger bite. Ironically, it's the smoother plane I made, but because it's applewood, which twists and shifts like a little kid during church service, I have had to flatten the sole enough times that the mouth is too wide for a fine shaving. I could patch it and reopen the throat, but it's beneficial to have a designated plane for faster stock removal. 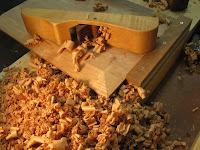 My jack plane (maple) can produce thinner shavings, so once I'm close to the lines, I run it across the bevel a few times to leave a finished surface. For the drawer itself, if you build it so that you can slide the drawer bottom in from the back after the drawer is assembled, you can use a drawer jig to clean up the outside, easily remove glue from the inside walls, and add finish to the drawer bottom before you slide it in place . A small brass screw at the back edge adds the finishing touch. The last photo shows 2 drawers from my tool cabinet that was built almost 4 years ago. The back and bottom of the drawers (on the right, and made from cherry) never see light. And notice how much lighter in color they are compared to the drawer front. In just a few years, the drawer fronts (also cherry) are nearly as dark as the walnut sides, even though the drawer fronts themselves rarely see light since there are doors on my tool cabinet.